All materials from the construction, renovation, remodeling or demolition of buildings. In addition, concrete, asphalt, landscape timbers, fencing, campers, boats, wood and stumps over 5 inches in diameter, etc. Must be free of hazardous materials I.E. asbestos siding, paint, etc. If you’re not sure ask. 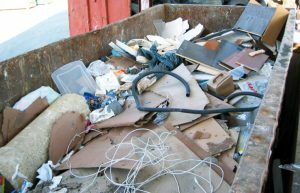 The material may go to a landfill or perhaps to a waste to energy incinerator.